I see boxes in my dreams. Big boxes. Little boxes. Boxes overflowing with crumpled newspapers and bubble wrap. Stacked boxes. Flat boxes. Empty boxes. Heavy boxes. Piles of boxes. Everywhere, boxes. While shopping the other day, I heard the sound of someone using clear packing tape – that scratchy, screechy sound it makes coming off the roll – and I shuddered. 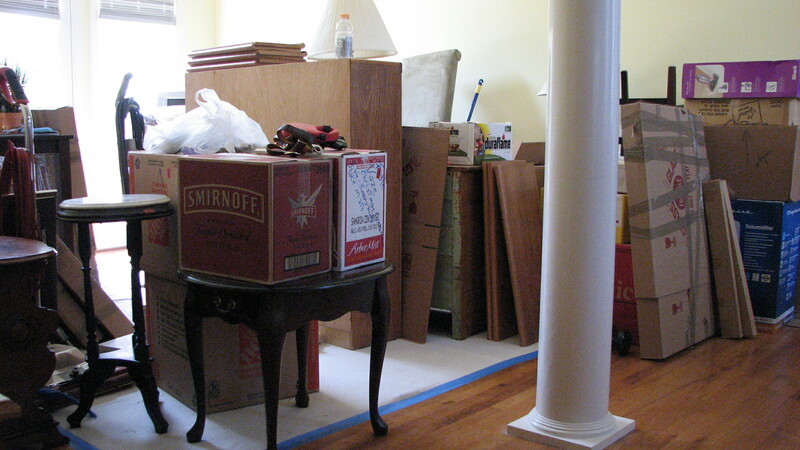 Perhaps it’s my own personal form of PTSD – the result of moving. Twice. In two weeks. Including to another state. It’s a horrifying fact of life for many Boomers as we downsize and head to warmer climes. And the current housing crisis is not really helping (but then again, it kinda is). in warm and wonderful North Carolina. We’d fallen in love with the area while owning a small vacation condo there, and the glut on the housing market was perfect for buying a nice home at a really nice price. All we had to do was quickly sell our New York house and we’d be heading into the warm sunset of southern living. Well, that was the plan. But you know what they say about plans…. The same buyer’s market that gave us a wonderful house in North Carolina made it next to impossible to sell our New York home, which went on the market early in 2009. We waited, and we waited, and we waited. We dropped the price. We packed away every family photo and cherished knickknack to ‘depersonalize’ the house as everyone tells you to do. We changed realtors. I staged the house. We dropped the price. We hired a professional stager to reorganize the layout. We changed realtors. Again. We dropped the price. Again. We gave up and said “screw it” and put the furniture where we wanted it and let it looked lived in. We dropped the price. Again. And, after a mere 2 ½ years, we FINALLY sold the house. Naturally, after all this time on the market, the buyer wanted in right away. So we started packing. And we packed. And we packed. Every waking minute of every day, we packed. While I was at work, Hubby packed. Box after box after box after box after box. How the heck did two people accumulate so much crap?! Our time frame made sorting a challenge, so we ended up moving a lot of stuff that we certainly didn’t need to keep. The day the movers arrived in North Carolina with our belongings, the heat index was 108 degrees. Hubby went golfing (with my blessing). Landscapers were pruning our shrubs with power clippers. Our dog was barking non-stop in protest of being shut in a room (which she escaped from several times). Lowes showed up to deliver new appliances. And the moving guys were coming through the door in rapid succession, constantly asking the question “where do you want this?” After several hours, I thought of several graphic suggestions for them, but I kept them to myself. I definitely felt too old for this effort. As the afternoon ground on, I told one of the movers firmly that I didn’t want him to bring any more boxes into the house. Boxes were piled everywhere, and there was barely room to move (did I mention that the kitchen and family room were in the midst of a total remodel?). The poor guy looked at me and wasn’t sure if I was kidding. He said “But there are more boxes on the truck!” I calmly explained that those boxes must belong to someone else, because we surely didn’t own enough stuff to fill all these boxes. He was still staring at me in confusion as I said “those boxes can’t be ours!” With a smile, he looked at me and said “Lady, you’re the last delivery – it’s all yours.” I cussed, laughed, and went back to work. Once everyone left, and Hubby returned, I sat and looked in amazement at how much junk we owned. And how sore and tired I felt. And how much I smelled (I was in the shower shortly after that). The next morning, we started UNpacking. And that was only slightly more fun than packing. Because it involved boxes. And boxes. And decisions to be made. Where to put things. Whether to keep things. What to give away. Where to put the empty boxes. A-r-g-h! Those damned boxes!!! Four days later, we were headed back to New York. Remember I said we moved twice? The second move involved clothes (way too many) and a very few possessions to a partially furnished rental house in our hometown. We’re not fulltime southerners yet. Why? Well, with all those price cuts on the hosue, I can’t exactly walk away from my steady paycheck to go freelance right now. So after partially settling things in North Carolina, we came right back to start unpacking BOXES in the rental house. More freakin’ boxes. Everywhere. Including in my dreams. I refer to this as the beginning of phase 2 of our “master plan”. It’s a temporary phase. Within a year, we’ll be starting a new life in North Carolina. And this will all be just a fuzzy, messy, exhausting, and box-filled memory.